I know how frustrating it would be when you add GoPro files to Quik for cutting and highlighting your family trip but are told "no files to import". That would ruin your plan to cut and edit your large-sized GoPro videos in Quik for YouTube/Instagram uploading & sharing. Well, how to get GoPro files imported properly? The below methods will point you in the right direction to import GoPro (4K/2.7K/1440p/1080p) files to Quik with nary a trouble. Wanna cut and edit GoPro 4K video without file import error? Batch import GoPro 4K/1080p files at 1 click without camera cable or SD card. 1. Edit/cut/crop/merge/enhance GoPro footage easily. 2. Support all video formats, e.g. 4K HEVC, H.264, MP4, MOV, etc. 3. Process GoPro 4K/2.7K/2K/1080p videos with GPU accelerated 5X faster speed. Part 1 - GoPro Quik File Not Be Imported on Desktop? Case 1 - No Files to Import When Using GoPro Camera or micro SD Card? Or your GoPro Hero 6/5 Black camera is successfully recognized by your desktop. However, the notification of "No Files to Import" shows up and the "Space Used" bar clearly indicates how many data occupies inside your 16/32/64GB micro SD card. If one of these cases happen to you, follow the below methods to fix it. Method 1: Reactive hardware settings via USB reset on Mac. 1. Target on Apple menu and then choose Shut Down. 2. Simultaneously press these keys on the keyboard: Shift + Control + Option + Power Button. 3. Hold down the button combination for approximately 5 seconds and free up them all at the same time. 4. Fire up your Mac and connect your GoPro camera to try again. Method 2: Disconnect GoPro camera and plug it in again via USB cable. Then manually move video files over and format the micro SD card. Method 3: Check if you have multiple installations of Quik. If so, uninstall all of them and install the latest version of Quik on your macOS. Method 4: Manually copy & paste files from GoPro camera into a Media Folder on your Mac. Afterwards, import files to Quik via Media Folder on Mac. Method 5: Edit GoPro video using VideoProc. 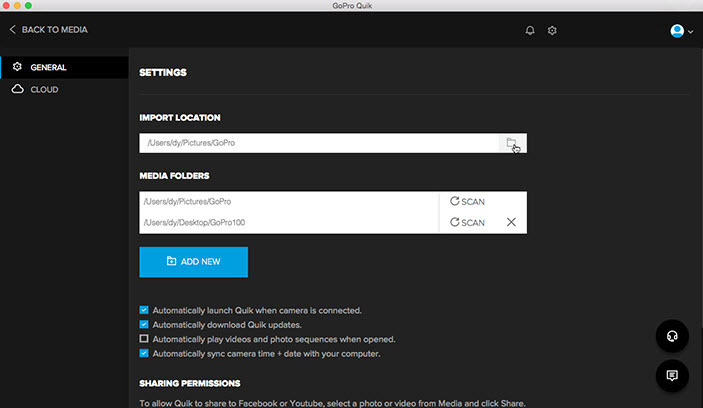 GoPro camera, micro SD card and Media Folder are the currently effective ways to import GoPro files to Quik. In case you've already tried them all but still no gain, you'd better leave it alone. There are more ways of killing a cat than by choking it with cream. Resort to a better alternative to Quik like VideoProc to cut, crop, rotate, merge, shrink, convert and process GoPro 4K/2.7K/1080p video at any frame rate (30/60/120/240fps) without such annoying file importing problem. How to Use VideoProc to Process GoPro Video? Please free download VideoProc Mac version or Windows version from Digiarty official website and then folllow the easy-peasy steps on how to hassle-free import GoPro 4K/2.7K/1440p/1080p videos to this versatile GoPro video processing tool for further editing. Step 1：Launch VideoProc on your desktop. You're suggested to utilize this GoPro video editor on a computer with the support of GPU hardware acceleration tech, which can be activated by VideoProc and used to quicken GoPro video processing speed up to 5X faster, no CPU overheating or CPU 92% high usage issues. Step 2： Import GoPro video files to VideoProc. Copy and paste GoPro video files to a media folder on your computer via GoPro camera or micro SD card. Afterwards, tap "Video" at the main interface > click "Add Video" icon to load GoPro files from media folder. 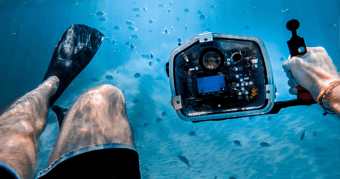 GoPro video files will be immediately imported without any hassle. And unlike Quik, this program supports adding almost any type of video format in whatever resolution, be it MP4, MKV, MOV, AVI, FLV, HEVC, H264 in 4K/2.7K/1440p/1080p/720p, you name it. Step 3： Edit GoPro Hero 6/5 Black video. Enable video editing features to cut, crop, rotate/flip, merge, compress GoPro videos, as well as add subtitles/watermark/effects to enrich your GoPro video. Shift your attention to the bottom of the home screen and target "Tool", which allows you to fix your shaky GoPro 4K video, rotate GoPro video 90/180/270 degrees, remove background noise from GoPro video, correct your fisheye distortion video, make GIF from GoPro and more. Note: VideoProc is able to compensate what Quik is lacking in GoPro video transcoding. This GoPro video toolkit also helps you transcode GoPro 4K HEVC to H264 for better compatibility and adjust GoPro video frame rate/resolution/aspect ratio for faster YouTube/Instagram sharing. Step 4： Start to process GoPro video. Tap "RUN" button after you select a destination folder for saving the output GoPro files. And this application will begin to process your GoPro video files in a manner that is low in CPU consumption (Intel/Nvidia/AMD GPU hardware acceleration) while high in picture fidelity (High Quality Engine). Case 2 - Receive Quik Import Cancelled Error Message Every Time? Quik appears to start downloading but immediately says Import Cancelled, no matter which way you use, GoPro camera or SD card. 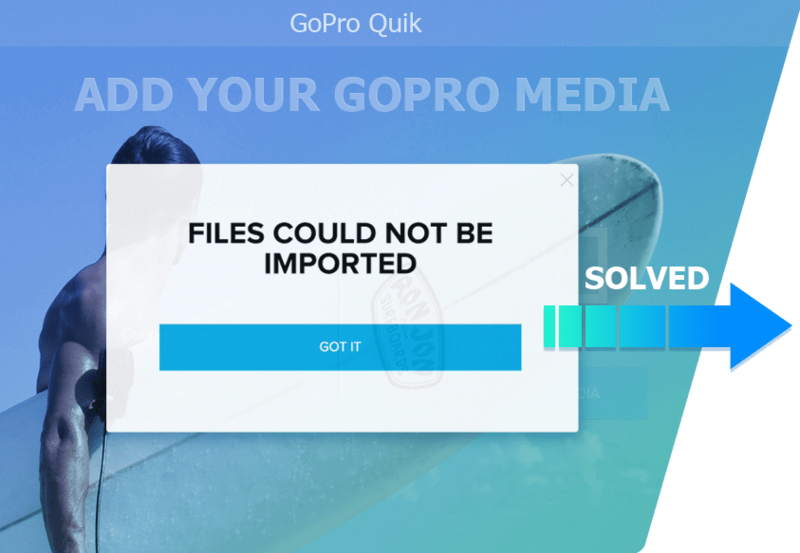 The error message "query cancelled" can be found at the error log files each time you intended to import GoPro files to Quik. Sounds familiar? Welcome to the club - who doesn't encounter such irritating problem? Fortunately, there are some effective workarounds available to troubleshoot this issue. Method 1: Update Quik to the latest version. Providing you've already upgraded your macOS to High Sierra or Mojave, it's seemingly necessary to update Quik to the latest version. The macOS system update has changed the built-in file system a little bit. Last, restart your Mac computer. Method 2: Re-select the destination folder. Access to "Settings" page from General under "Manage Folders in Settings" on Quik and hit the folder icon near to "Import Location". Afterwards, choose destination folder again although it has nothing different from the folder in "Import Location" already. Just do that and everything will come back to normal. Case 3 - Quik Won't Import GoPro Files from Google Drive/iCloud? You're not the only one who'd like to save GoPro Hero 5/6 Black files to cloud storage services like iCloud, Google Drive, Dropbox, etc. for eternal preservation. So you're not alone when you are trapped in the trouble of "GoPro Quik fails to import files from Google Drive/iCloud". There are some simple yet quick problem-solving methods provided by those who have similar experience with you for reference if you can't fix this issue on your own. Method: Convert downloaded GoPro file format to MP4. Some Quik users pull the downloaded GoPro files into Quik but it says they're the wrong format. Probably, the original video format has changed after uploading to cloud service. If so, the most direct and effective way is to convert downloaded GoPro files to Quik supported MP4 with H264/HEVC codecs. 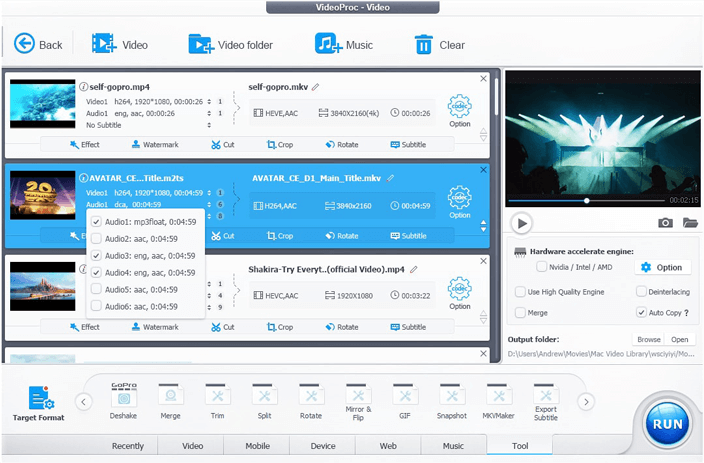 VideoProc, your professional problem solver, lets you convert your Google Drive/iCloud downloads to MP4 format with H264 or HEVC codecs without sacrificing quality, 4K/2.7K/1440p/1080p reserved. Case 4 - 0 files added When Scanning Local Media Folder? It seems weird. You update GoPro Quik to the latest version and select the correct media folder. However, Quik just displays the message "0 files added" after scanning the local media folder. Chances are that your file structure organization isn't the same structure when recording on a formatted card. No worries! A simple solution is found to easily help you out. Method: Use a micro SD card adapter to change your GoPro file folder name. You know, users are disposed to change the GoPro folder name, e.g., "2018GOPRO" to another naming convention "520GOPRO". If so, Quik would decline your request to import the files from its library. Therefore, make sure to change your folder name back to the original "2018GOPRO" via a micro SD card adapter. Part 2 - Unable to Import GoPro Files to Quik on Mobile? Import errors also happen on Quik for mobile now and then. The difference lies in that some video files from GoPro Hero 5/6 Black can be successfully imported to Quik on iPhone/Android while some prompt the error message saying, "We couldn't import these videos. This is likely due to the high frame rate or resolution. We recommend you create shorter clips and import those instead". Actually, most users reflect that all the video footages are recorded at the same resolution/frame rate and that none of the video clips is more than 30 seconds. Hence, the recorded video files can't take the full responsibility. Anyway, follow the below solutions to have a try if you are at the end of the road. Method 1: Edit GoPro video in iMovie. 1. Open GoPro video files in Photos app to check if it's damaged. 2. Import video file to iMovie to do some editing stuff. Just cut off 1 second from your GoPro video if you don't wanna do anything change to it. 3. Export video from iMovie and save it as MP4 format. 4. Load edited video file to Quik. If iMovie can satisfy all your needs, just skip this step. Method 2: Add GoPro files via other paths. All roads lead to Rome. You can also consider iTunes, iCloud, Google Photos, Dropbox, etc. to load files to GoPro Quik on your iPhone/Android. After you successfully import GoPro Hero 5/6/7 video to Quik, you can eventually further edit GoPro 4K 60/30fps video like trim, rotate, flip, add special effects, etc. Yet, some advanced features are absent from Quik currently, such as GoPro deshake, denoise, fisheye correction, etc. Therefore, supposing you want to fix GoPro shaky clips, solve GoPro video audio out of sync problem, remove background noise from GoPro file, VideoProc is your ultimate choice with all features covered. Unable to upload GoPro big-sized video to Ins/YouTube? Resize it now! Follow the guide to transcode GoPro 4K h265 to h264 codec.